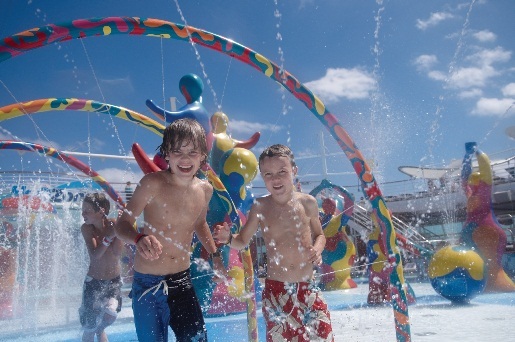 Considering a family cruise? I’ve said this before, but I just can’t reiterate it enough; one key to really enjoying your cruise together can be an excellent children’s program. It truly can make a huge difference in how much the cruise is appreciated by everyone. If you’re unsure of what to look for as far as amenities, I’m going to try to help you out by supplying information on some of the cruise industry’s top programs. Think of it as a jumping off point; each family’s needs are different, so pick the program that provides the best amenities for YOUR family. Some lines provide a more adventure-driven program, while others tend toward cerebral or creative pursuits. This week, I’m going to bring you some information on Royal Caribbean, which has a complimentary, year-round Adventure Ocean program, and is recognized as one of the industry’s leading youth programs. For all kids and teens, ages 3 to 17. * Please note 18 year olds are not permitted in the teen program and that no exceptions can be made. All children’s activities are supervised by male or female youth staff and must have a 4-year university degree or international equivalent in Education, Recreation or a related field. All staff also has at least 3 – 5 years’ qualified experience in working with children ages 6 months – 17 years. At sea – 9 am to 5 pm; 7 pm to 10 pm. In port – 30 minutes prior to first shore excursion to 5 pm; and 7 pm to 10 pm. At sea – daytime activities vary; nighttime activities – 8 pm to 2 am. In port – daytime activities vary; nighttime activities – 8 pm to 2 am. At sea – daytime activities vary; nighttime activities – 9 pm to the wee hours. In port – daytime activities vary; nighttime activities – 9 pm to the wee hours. adult nightclubs (teens have their own nightclubs, Living Room and Fuel). line of toddler art tools will be featured in unique developmentally-appropriate art activities designed for parents and children to enjoy precious creative moments together. There is a charge of $8 per hour per child. Royal Babies (6 months – 18 months)/Royal Tots (18 months – 36 months) – Royal Caribbean International has teamed up with Fisher-Price to develop playgroups for parents with children age 6 months to 3 years. Fun, age appropriate activity sessions have a variety of themes that encourage little ones to explore and make new discoveries. At the same time, parents learn creative techniques for adding skill building to playtime. Royal Babies (6 to 18 months) will enjoy Musical Inspiration, Everyday Early Learning and other themes. Royal Tots (18 months to 3 years) sessions include Fun on the Farm, Out & About in the Neighborhood and more. A parent must accompany their child. During the day, Royal Tots can create early childhood memories at four new Crayola Beginnings workshops. During each 45-minute session, parents and their children enjoy story-time with an Adventure Ocean counselor, and use Crayola Beginnings products to create the toddler’s first works of art. Themed sessions include My Colorful World (introducing the concept of colors); Families Have Fun (introducing the world of coloring); Let’s Explore the Sea; and Our Big, Big Ship. Parents traveling with infants and toddlers can now pack lighter for their cruise with Royal Caribbean’s Babies 2 Go program, where parents can order organic baby food and diapers, wipes and creams by Huggies – the world’s leading diaper brand – for delivery to their staterooms upon their arrival. These baby essentials can be ordered online through Royal Caribbean’s Gifts & Gear section at RoyalCaribbean.com. A treasure chest of Fisher-Price toys is available to families during their stay in the Fisher-Price Toy Lending Program, comprising a collection of developmental toys specifically created for infants and toddlers, ages 6 – 36 months. Parents can borrow and exchange toys for a new activity every day to help growing minds learn through play. Next up…. The creative side of Royal’s program, “Edu-tainment”, and their youth facilities and amenities.